Yes, I finally got up the nerve to send out emails a couple of weeks ago that was somewhere between won’t you be my friend and don’t you want to come to my book club? We had our inaugural meeting this week and a strong showing of seven people. I was quite pleased (and relieved!) with the turnout and the conversation. It was the perfect mix of getting to know each other, deciding who is going to order the Jane burger and who isn’t, did you like the book, have your 20s (thus far) really changed you… etc. 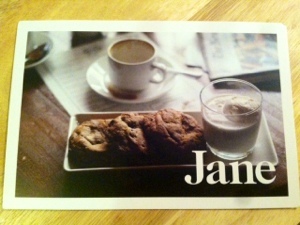 I would definitely recommend The Jane for great food and a quieter, conversation-friendly atmosphere during the week. Also, definitely opt-in on the fresh cookies and milk! Our first book was “Rules of Civility” and while initially I was a bit meh on it, the more I thought through it, the more I enjoyed it and liked it. So two notes moving forward about books and the blog – I like to read. A lot. And while I have quite a bit to say about books (just ask Hewitt), I have struggled with how to structure a post about them that isn’t merely a summary or doesn’t read like a college paper. So initially, my plan is to take a question about the book – be it one that I had or one I find reading other blogs, guides in the back of the book, etc, and answer that in a post. For now, I think that will provide direction and prevent literary ramblings. Secondly, we have selected our books for our next meeting. That’s right – books, plural. We’re going to read Gone Girl and Dark Places – both by Gillian Fynn and hopefully discuss how the books are similar and different, what we think of her as a writer, her work, and definitely what everyone thinks of the ending of Gone Girl. But I won’t spoil that here.